In their fifteen year history, which includes the 2008/2009 financial meltdown, a grand total of three Exchange Traded Notes (ETNs) have gone bust due to credit default—all 3 were issued by Lehmann Brothers. The total loss to investors was less than $15 million. This article on ETF.com gives the detailed story. How many public companies have gone bankrupt, rendering their stock worthless, in the last ten years? A lot more than three, and a lot more than $15 million was lost—but we don’t see many articles saying that stocks in general are dangerous. You don’t monitor your fund— in particular, to see if your fund has stopped creating new shares. A good way to do this is to setup a Google alert (e.g. TVIX ETN). You can configure the alert to send you an email periodically if there are any new web references to your alert text. Of these 6 items, only 4 and 5 are specific to ETNs, all the others, including credit risk can be problems for ETFs too. I’ll discuss credit risk for ETFs at the end of this post. So what is this dreaded credit risk? Unlike stock which offers ownership of a company, corporate bonds and notes are debt obligations. If a corporation gets into financial trouble to the point where it can no longer meet its obligations (e.g., interest payments, ETN share redemptions) then it goes into default and the holders of these notes and bonds may only get some portion, or sometimes none of their money back. The risk of a company defaulting is called credit risk. When a company defaults its stock has lower priority, or rights to company assets than either notes or bonds—typically the stockholders get nothing. ETNs are usually unsecured senior notes, which means they aren’t backed by collateral, but by virtue of being senior they have higher priority than general corporate bonds. The current price of the Credit Default Swap (CDS) on the issuing company. 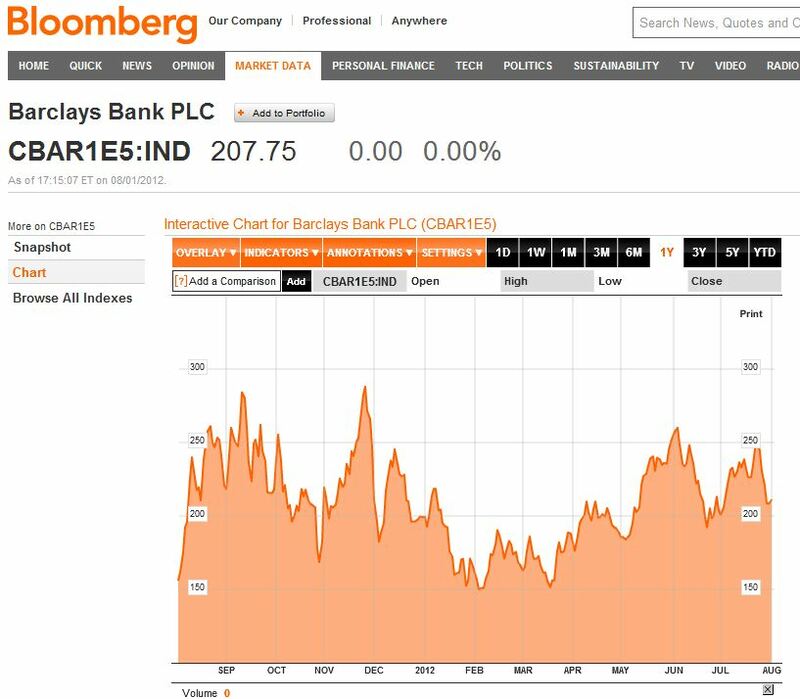 Below is a Bloomberg chart showing Barclay’s 5 year CDS over the last year. The annual price is expressed as a percentage of the value being insured (notional value). The percentage is expressed in basis points—each basis point is one-hundredth of a percent. So to insure $10 million of Barclays’ debt against default for a year using this quote would cost 2.0775% per year, or $207,750. Credit ratings are available free online by companies like Moody’s and S&P, although you will need to register to get access. CDSs are essentially insurance policies on debt from a company (or country). If the market thinks the risk of an entity defaulting on its debt is increasing, then the price of the CDS goes up. CDS prices used to be free on Bloomberg but are now a paid service. The chart below shows credit ratings (August 2016) and CDS rates (August 2012) for some of the companies that issue ETNs. 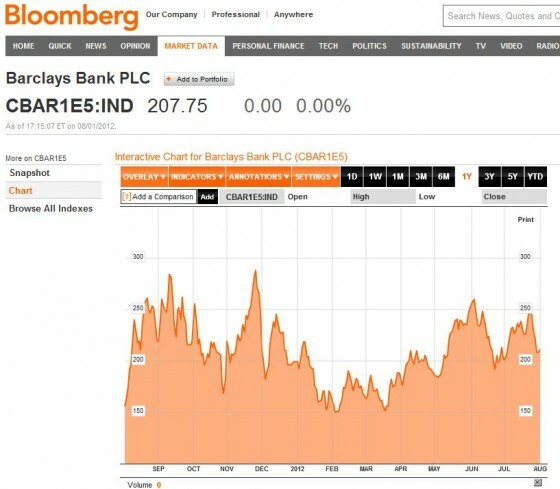 For reference, 5 Yr CDS for many of the big international banks can be found here. As I mentioned above, some ETFs have credit risk too—if they include swaps as part of their portfolio. I haven’t done a systematic search, but they can be used by leveraged volatility ETFs (UVXY holdings) and commodity ETFs (UDC holdings). Swaps are notes issued by companies that offer performance tied to a specific benchmark (e.g., interest rates, volatility indexes, commodity indexes). If the issuing company goes bankrupt the note will likely be compromised. In the case of ETFs this credit risk is not carried by the issuer, instead any losses are passed directly to the share price of the ETF. 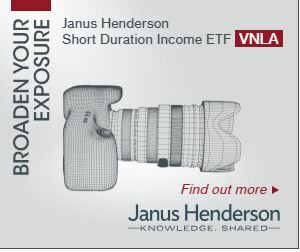 ETFs try to manage this risk, for example with collateral, but the risk is there. See the UVXY prospectus if you would like to see more information about credit risk within an ETF. Bottom line—the credit risk of your ETN is probably the least of your worries. By all means, bail out if the issuer gets into trouble, but the market itself is a far bigger risk to the value of your ETN.